Home politics DETAILS EMERGE HOW NASA LAWYERS MET SUPREME COURT JUDGES DURING HEARING. DETAILS EMERGE HOW NASA LAWYERS MET SUPREME COURT JUDGES DURING HEARING. More revelations are coming to light on what happened leading the nullification of presidential elections in Kenya. A damning affidavit has been filed at the Judicial Service Commission (JSC) seeking investigations against Deputy Chief Justice Philomena Mwilu and Supreme Court judge Isaac Lenaola over gross misconduct. The affidavit by one Derick Malika Ngumu, the executive director of Angaza Empowerment Network based in Mombasa, exposes underhand dealings between National Super Alliance (NASA) and the Supreme Court judges before the historic ruling. This could change the whole picture of supreme court ruling. In his petition, Ngumu has attached what he claims are phone conversation records and meetings that took place before the ruling was made. The Law Society of Kenya has also been roped into the scheme. 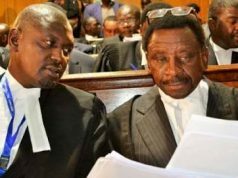 Mwilu, according to the affidavit, had communication with Orengo through a mobile number registered under Orengo’s sister where they had lengthy conversations with NASA. Between Wednesday, August 6 and Friday, August 18, Mwilu met and had lengthy conversations with Orengo and Moses Wetang’ula at different places including Menelik Hospital and Sky View apartments, both in Kilimani area.